Apple released the iOS 5.1.1 firmware today featuring bug fixes and small stability improvements while taking HDR photos. Although we warned users to stay away from updating their iPhone, iPod Touch or iPad to the iOS 5.1.1 firmware, I am sure there are those who accidentally did. Yes you can Jailbreak the iOS 5.1.1 firmware tethered with RedSn0w, but if you previously had an Untethered Jailbreak on iOS 5.0.1, a tethered Jailbreak just doesn’t suffice. Thus, if you are looking for a how to guide on how to downgrade from the iOS 5.1.1 firmware to the iOS 5.0.1 or iOS 5.0 firmware you are in luck! In this how to guide from iJailbreak.com you will learn how to downgrade your A4 iOS device to the iOS 5.0.1 or iOS 5.0 firmware from iOS 5.1.1. Before we start however make sure you meet the requirements listed below. If you have an iPhone 4, iPhone 3GS, iPad 1G, iPod Touch 4G, iPod Touch 3G then this how to guide will work for you. For those looking to downgrade their iPhone 4S or iPad 2 you are out of luck at this time unfortunately. APTicket + saved SHSH blobs for the iOS 5.0.1 or iOS 5.0 firmware. Step 1) – The first thing you will need to do is download a tool developed by iH8Sn0w called iFaith. What the iFaith tool does is dumps the SHSH blobs directly off your iPhone, iPod Touch or iPad for the firmware you are currently running. Allowing you to stitch together a custom firmware that can downgrade your iOS device to a previous firmware version Apple is not signing. If you are following this how to guide you most likely already used this tool to dump your iOS 5.0.1 or iOS 5.0 SHSH blobs. 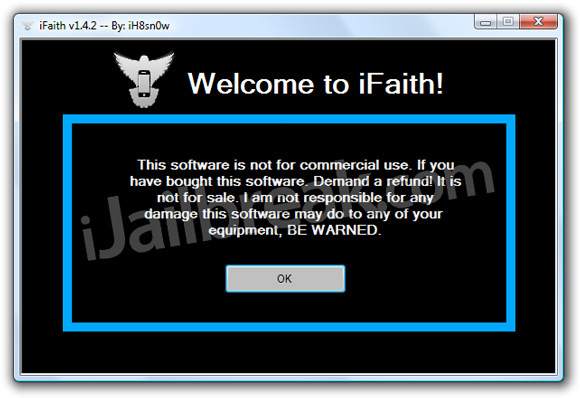 Step 2) – The next thing you will need to do is run iFaith (click the OK button once you have read the warning). Step 3) – With iFaith up and running you will need to click the Build *signed* IPSW w/ Blobs button. Step 4) – Upon clicking the button previously mentioned you will need to browse for the saved SHSH blobs file that was created when you saved your SHSH blobs for the iOS 5.0.1 or iOS 5.0 firmware. Step 5) – It is now time to browse for the iOS 5.0.1 or iOS 5.0 firmware file. Depending on which SHSH blob file you selected you will need to select either the iOS 5.0.1 firmware file or iOS 5.0firmware file (download iOS firmware files here). Step 6) – After you have selected the right firmware file iFaith will begin creating your custom firmware file. Step 7) – When your custom firmware file has been created go back to the iFaith main menu (if you are not there already) and click the Use DFU Pwner (iREB) button. Now simply follow the instructions presented to you for putting your iPhone, iPod Touch or iPad into pwned DFU mode. Step 8 ) – With your iOS device in pwned DFU mode you will need to launch iTunes and restore your iPhone, iPod Touch or iPad to the custom firmware file you created. This can be done by Option (alt) clicking the Restore button on Mac OS X or by SHIFT clicking the Restore button on Windows. If you experience iTunes Error 3194 then you can click here to follow another how to guide on how to fix it. For those that got success, congratulations! You have now downgraded your A4 iOS device from the iOS 5.1.1 firmware to either the iOS 5.0.1 firmware or the iOS 5.0 firmware. To Jailbreak your iOS device untethered click here to go to iJailbreak’s How To Jailbreak Section. If you have any further questions or concerns please leave them in the comments section below. I’ve messed up my AppleTV2. I’ve tried to JB, but it didn’t work. Only thing I can do is reinstall through Itunes. If I do that will it automaticly install 5.1.1 or can I choose 5.1? You can chose. When restoring in itunes, hold down shift then click restore. And select the 5.1 firmware. Will this work for Iphone 4S 5.1 having SHSH.blobs of 5.0 and 5.0.1. Please reply !!!! I have a iphone 4 factory unlocked, if i downgrade, will i lose the unlock ?? and if i downgrade, the baseband will be 04.11.08, and now it is 04.12.01. need help ???? if i downgrade and restore do all my files get deleted ? I am getting an error 37 all the time!!! haha u think ios6 i just around the corner?! Yeahh, because the process reset the iphone like when you buy it. if i use this method will my baseband be changed? Worked perfectly for me to downgrade from 5.1.1 to 5.0.1 in iP4, thank you! Worked like a charm to downgrade iP4 from 5.0.1 to 4.3.5, when all other methods failed! Thanks a lot for this great tutorial and Hats off to iFaith developer! mine is 5.1.1 (9B206) can i use this method? I have an ipod 4g 5.1.1 firmware and i want to downgrade to 5.1 i have shsh but from umbrella not ifaith how i downgrede :( ? not worked it says the shsh file not supported!!! !